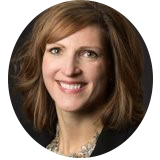 Lori Young has over 20 years of experience as an executive and career coach, trainer and designer of nationally award-winning leadership development programs in healthcare, banking and higher education. These programs and services directly impacted leaders’ abilities to communicate, influence, collaborate and engage peers and direct reports. Lori started her coaching practice after a successful career leading leadership and career development programs at the Cleveland Clinic, Federal Reserve Bank of Cleveland, Case Western Reserve University and Baldwin-Wallace University. She is currently the Director of the Career Center at Oberlin College and a Senior Consultant with the telos institute. She has coached over 150 individuals and teams. She is a credentialed coach through the International Coach Federation as a Professional Certified Coach (PCC) and is a Certified Leadership and Talent Management Coach (CLTMC) with the Leadership Coach Institute. In her work, Lori builds authentic relationships with her clients to help leaders achieve goals through strong communication and interpersonal skills. Clients describe Lori as bringing a refreshing attitude, positive energy and enthusiasm to the relationship. Her calm, attentive and patient approach helps leaders develop in a manner that is sustainable and impactful. One of Lori’s greatest strengths is to teach leaders how to apply tools that make communication and collaboration easy and effective.